Combinatorial and Relational Network as Toolkit for Dutch Language Technology. Cornetto is a lexical semantic database for Dutch, covering 92K entries, including the most generic and central part of the language. The database combines the structure and content of Wordnet and FrameNet-like data. It contains both vertical and horizontal semantic relations and combinatorial lexical constraints such as multiword expressions, idioms and collocations on the one hand, and lexical functions and frames on the other. The concepts are aligned with the English Wordnet so that ontologies and domain labels were imported. A new release of the Cornetto database is now available from the TST centrale: Cornetto database at the TST centrale Cornetto has been revised during the DutchSemCor project. DutchSemCor resulted in the annotation of the SONAR corpus with the meanings of the most frequent and polysemous words in Cornetto. The release of Cornetto 2.0 will be extended with word-sense-disambiguation systems that were developed during DutchSemCor. P.Vossen, I.Maks, R.Segers, H.van der Vliet, M-F.Moens, K.Hofmann, E.Tjong Kim Sang, and M.de Rijke. 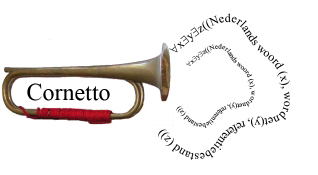 Cornetto: a Combinatorial Lexical Semantic Database for Dutch. Chapter 10 in: Spyns, Peter; Odijk, Jan (Eds.) Essential Speech and Language Technology for Dutch. Results by the STEVIN-programme. Series: Theory and Applications of Natural Language Processing, 2013, 2013, XVII.